As noted last week, I was pointed to Julie Czerneda’s books by the Little Red Reviewer blog, and subsequently started the first of three books in The Clan Chronicles trilogy, Reap the Wild Wind. I finished that, and liked it a lot. During a the short wait until the next book was available from the library, I read Summer of ’68 – The Season That Changed Baseball– and America by Tim Wendel. I think the author tried to do too much, recounting the baseball season and all of the political happenings in that turbulent year. The result is choppy, but with some interesting parts. 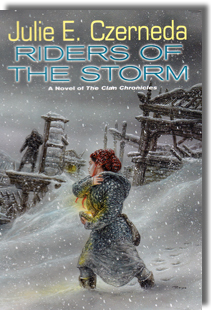 Now I’m about a quarter way into Riders Of The Storm, the second Clan Chronicles book. This one is a little slower to get going than the first book, but already knowing the setting and characters makes it easy to slip into. I’m continuing to read – and enjoy – Czerneda . Barbara finished John Sandford’s Extreme Prey. She thought is was predictable and not one of the better books in the series, but likes reading Sandford and wouldn’t miss a prey book. 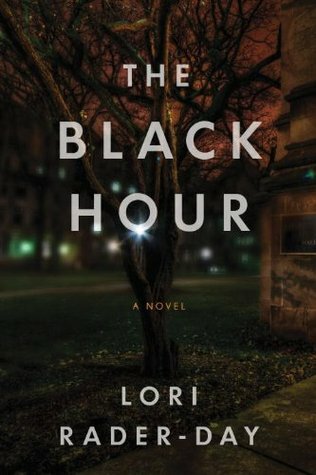 Now she’s reading The Black Hour by Lori Rader-Day, about a college professor, returning after a near-death attack by a student. It is Rader-Day’s first novel, and Barbara says it’s very good so far. This entry was posted in Books & Reading, current reading. Bookmark the permalink. I was wondering about that Rader-Day book because it’s been nominated for some awards. One new arrival this week: Patti Abbott’s SHOT IN DETROIT. I read ZIGZAG, the new collection of Nameless stories by Bill Pronzini. As mentioned this has two previously published stories and two new novellas. Good stuff as always – I’ve been reading Bill’s books for over 40 years – though there is a “woo woo” factor in one of the stories. I particularly note that because I followed this up with another book with the same factor, Craig Johnson’s THE HIGHWAYMAN. This is not the first Walt Longmire book with an “eerie” element to it, as long-time readers will know. Lastly I read a soso ebook collection of stories I got because it was free (I’m pretty sure) and because of authors like Patti Abbott. This was ALL DUE RESPECT: THE ANTHOLOGY, edited by Chris Rhatigan. They are “crime” stories rather than mysteries, mostly about lowlife criminals, drug dealers, etc. The Abbott and some of the other stories are good, but overall, not so much. Current reading: INSPECTOR MONTALBANO’S FIRST CASE, the collection by Andrea Camilleri, as previously mentioned. Also the latest Insp. Sean Duffy book by Adrian McKinty, RAIN DOGS, set in the Belfast of 1987. Jeff, Barbara is liking the Rader-Day book so far she’s almost halfway through it. I’ll have her full reaction next week. I have ZIGZAG on hold from the library, but it’s a ways away. Apparently lots of other people want to read it too. So far I’ve only read the Longmire short story collection, but still have the first book near the top of the TBR pile. Yep, just because it’s free doesn’t mean it’s good, often the opposite. I’m sure you’ll enjoy INSPECTOR MONTALBANO’S FIRST CASE. Thanks, Jeff. I am reading THE BLACK MOUNTAIN by Stout and DAREDEVILS, which I think I mentioned last week. Mostly I am reading in anticipation of two book talks this week. Will be glad to get this behind me. Patti, I’m surprised to report I’m struggling with my Stout pick, CURTAINS FOR THREE. I think it may be trying to transition from SF for a few pages, then back. The fiction is SERENA by Ron Rash, about a married couple who run a large timber company in Depression-era North Carolina and the lengths they will go to to make sure events go their way. The language is poetic, although the action is dark and violent; there’s almost a Cormac McCarthey feel to some of the prose (although not quite so dark). There’s also an interesting subplot about the development of the Pisgah National Forest and the federal government’s use of eminent domain to acquire the land. The non-fiction is Jake Halpern’s BAD PAPER: CHASING DEBT FROM WALL STREET TO THE UNDERWORLD, which follows the path of what happens to consumer debt after it has been charged-off by the originating bank or credit card company. Suffice to say, some very unsavory characters get involved in an area that essentially functions in a regulation-free environment. Two things stand out for me: (1) it costs money to be poor; and (2) I never want to be in a situation where my loan or credit card gets charged-off–the debt haunts you forever. Deb, did you see John Oliver’s piece on debt a couple of week’s ago? I thought of that John Oliver segment too. Unbelievable. Some of those people make loan sharks look good. I did not see Oliver’s segment, but if it covers the same territory as the book, debt collection is a scary business. Helpern’s book takes place mainly in Buffalo and almost everyone involved in these small debt-collection agencies had served prison time, usually for drug-related offenses. The same intimidation tactics that work on the street are imported into the high-pressure debt-collection shops. Scary stuff! And it’s basically unregulated. I haven’t read the Rash novel but I’ve read several of his short story collections, which were very good. Deb, I’m not familiar with either of those books, but I would concur that debt is a real problem, and collection of it more so. I spent most of the week with joe hill’s newest, THE FIREMAN. It’s a big thick book about a world-wide epidemic of spontaneous human combustion. Hill spent four years writing this one and it’s his most ambitious work to date. It can be read as a science fiction book or a horror novel; either way, I enjoyed it thoroughly. I also read ISAAC ASIMOV PRESENTS: THE BEST SCIENCE FICTION OF THE 19TH CENTURY, an Asimov-Greenberg-Waugh anthology with fifteen stories from 1817 to 1899. As usual with their anthologies, familiar stories are mixed with unfamiliar ones and authors like Shelley, Poe, Hawthorne, de Maupassant, Doyle, Wells, and Jack London stand alongside lesser-known figure like Edward Page Mitchell, Robert Duncan Milne, J. H. Rosny aine, and Cutcliffe Hyne. Because science fiction as a genre would not exist until the 1920’s, there is a bit of fantasy here also. A few of the stories read like tracts but, overall, a good collection. As for graphic novels, I read Jonathan Maberry’s DOOMWAR (pitting Dr. Doom against much of the Marvel universe) and three Captain America collections by Ed Brubaker, the best of these being THE LIFE STORY OF BUCKY BARNES. Currently, I’m reading LOVECRAFT COUNTRY by Matt Ruff. Told from the point of view of two Black families in 1954, it’s about a secret occult society trying to gain the ultimate power. It makes one wonder which is worse, endemic racism or Lovecraftian soggoths? I’m about three quarters through this unusual take on the Lovecraftian mythos. We’re gearing up for a busy few weeks. My youngest daughter and oldest grandson landed in Dublin about an hour ago on the first step of a tour of Ireland, England and France. We’ll be taking care of three-year-old son (the Kangaroo) most of the time while Christina’s husband works. I imagine we’ll also be chauffeuring our youngest granddaughter to various gigglefests with her friends. Meanwhile, our oldest daughter and her two girls began wending their way here yesterday. They (and their dogs, cats, snake, and furniture) will be staying with us for a few months while they find a house in the area. It’ll be great to have the whole famdamily together once again. Have a great week, Richard, and enjoy Julie Czerneda. I have to say, Jerry, this week your reading was of books that don’t interest me very much. On the comics front. I did pick up the DC Rebirth #1, and though it confusing and pretty pointless, with no ending and little sense. I read a few of the New 52 books for a couple of issues, and let those go, and now this. DC seems to be trying to reinvent themselves over and over without much success. All that family would be overwhelming to me. I thought your daughter and her girls had already moved to that area just before you did. Maybe the whole clan is moving to FLA? My youngest daughter and her clan moved here when we did, Richard. Now that my oldest daughter’s youngest graduated from high school, that part of the family is on its way. Luckily, my family is not overwhelming — quite the opposite, in fact. We’re looking forward to it. Like Jerry, I’m reading LOVECRAFT COUNTRY. My goal is to finish reading all the 10 library books I have stacked up. That should take you about 4 days, George, as fast as you read! Gonna have to read that Czernada series. Charles, this second book is pretty s-l-o-w compared to the first book. If it doesn’t pick up I won’t be continuing. Richard, I’m still reading FATHERLAND by Robert Harris, post-which I’m tempted to read a P.G. Wodehouse. The four-month long monsoon has set in. The weather is wet and clammy. And it seems like a nice time to catch up on some good humour. Prashant, we have our rainy season here, but it’s nothing like your monsoon! Good luck with getting around, and yes, it sounds like good reading weather.